Old Forester Rye is a Kentucky Straight Rye created by Master Distiller Chris Morris and Master Taster Jackie Zykan. Taking inspiration from Normandy Rye, a brand acquired by Brown-Forman in 1940, it’s made from an unusually high malt recipe of 65% rye, 20% malted barley, and 15% corn. 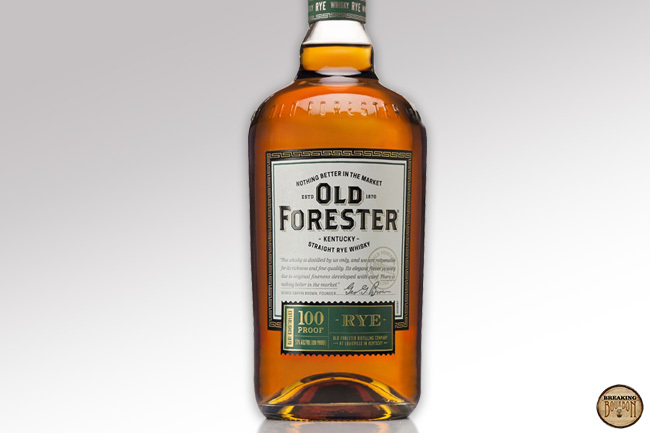 According to Morris, the high percentage of malted barley “allows for a wholly natural fermentation process, leveraging Old Forester’s proprietary yeast strain.” It’s released at the same proof and price point as Old Forester Bourbon. Initially introduced in January, 2019 and nationwide in February, 2019, this will be an ongoing release. Floral aromas upfront integrate with sweet brown sugar and a citrusy zest. The floral notes seem unusual for a rye, bringing a unique yet subtle twist to the category. A light hint of bananas is followed by a mixture of spices - cloves, allspice, and a trace of nutmeg. Cocoa and a faint nuttiness round it out, providing a well balanced and integrated sip. It’s a tad light for the proofpoint, with less spice than I would have expected for a rye. Approachable and manageable, yet not quite as robust as the proof would suggest. Initial peppercorn spice is overtaken by brown sugar sweetness, yielding a medium length finish that trends towards the sweeter side. Nothing about it is off-putting in any way, however it lacks the depth otherwise found on the nose and palate. Such a high percentage of malted barley in a rye from a major distillery is unusual, as it typically ranges from about 4-12%. Generally speaking, malted barley’s primary purpose in bourbon and rye mashbills is to aid in the fermentations process, serving as the primary source of sugars necessary for fermentation. Thinking of major distilleries, MGP Ingredients introduced a 51% rye, 49% malted barley mashbill in 2014, and while it’s likely made its way into a number of brands today, it is also likely blended with other mashbills and has not become commonplace as a standalone product. Last year Brown-Forman released Woodford Reserve Straight MaltWhiskey, which contains 51% malted barley. Other American whiskey distilleries experiment or even specialize in malt whiskey, sometimes using malt as much as 100% of the mashbill. While this is a growing category, it is still arguably uncommon. As evidence just look at your local retailer’s shelves - the percentage of American whiskey that would be classified as malt whiskey or even have an unusually high percentage of malt is relatively low. It may seem like a tangent to be focusing on malted barley when analyzing a rye, however its high percentage plays an obvious role in the flavor profile of this rye. 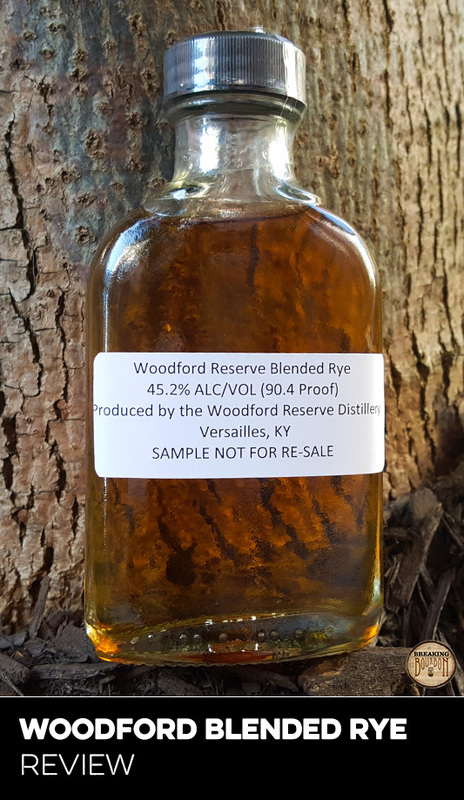 While many ryes are “just barely” rye at 51% rye along with a high percentage of corn, this rye is made from a 65% rye mashbill with 20% malted barley, and only 15% corn. 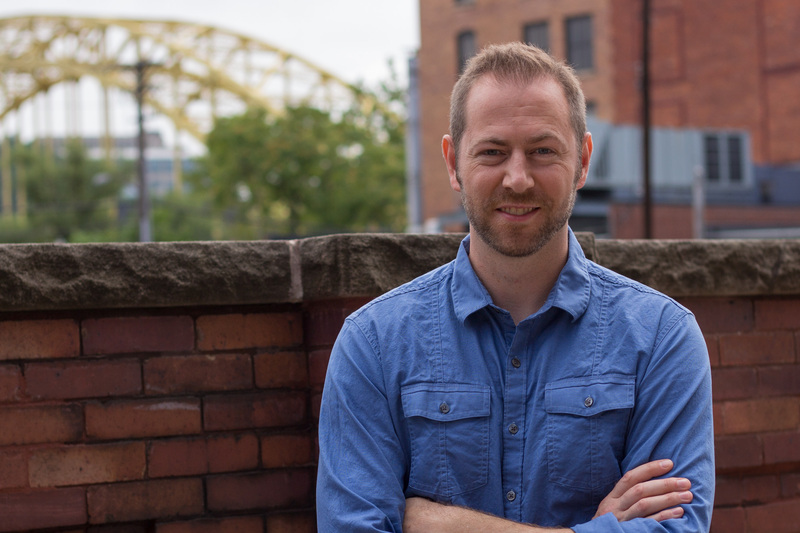 What results is a rounder, softer flavor profile edging towards the characteristics that can be found in the growing American malt whiskey category. My guess is this is what contributes to the faint cocoa and nuttiness I noticed - flavors I rarely notice in rye whiskey. Overall this seemingly slight shift in mashbill away from the norm moves the needle just enough to yield a flavor profile that feels slightly new and different. When completing the release date category in our classification section above, it is always refreshing to type “ongoing” for a new release. With a suggested price of $22.99, this lands squarely in today’s value category. Because it’s new and will reach different markets at different times, there might a brief perception of a swell in demand, however I believe Brown-Forman intends this to always be readily available. Notably, their press release says, “it plays beautifully in cocktails,” and the additional marketing pamphlet that arrived with the bottle dedicated half of its space to cocktail recipes. 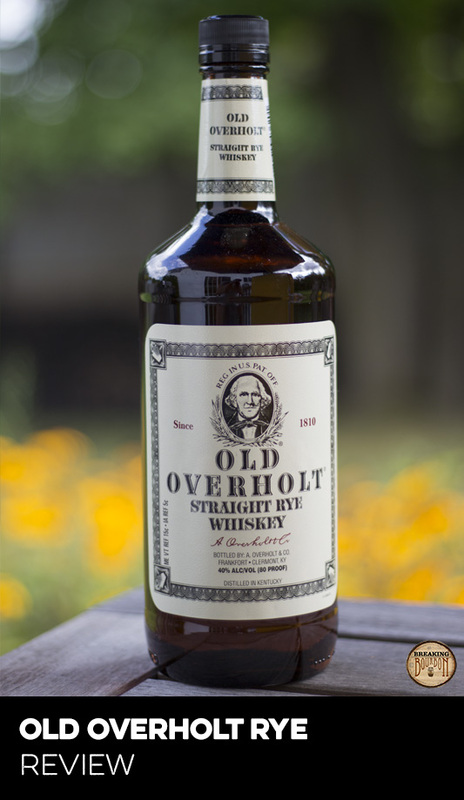 Its price combined with its relatively robust 100 proof point and less than edgy flavor profile suggests cocktails are not just an afterthought, but more what this whiskey was primarily designed for. It drinks well on its own, and I think few will dislike it. To that end, it’s priced quite well and an easy recommendation as something to mix or sip casually, depending on your audience. 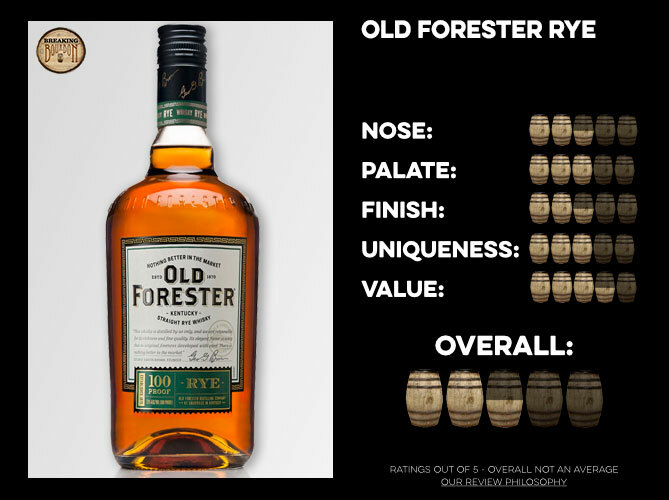 Old Forester impresses again with a new, quality, and soon-to-be readily accessible rye whiskey that costs just north of a 20 spot. When describing this whiskey, it’s important to ensure I’m providing enough perspective. 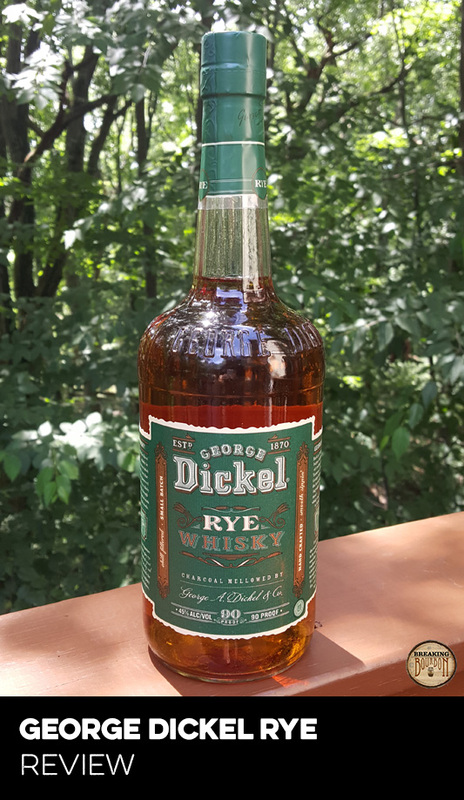 As I’m generally impressed with this rye for specific reasons, it is clearly a value whiskey ideal for cocktails and casual sipping. I can’t say that as a whole this is a whiskey that will impress a more die-hard enthusiast based on flavor profile alone. But die-hard enthusiasts aren’t the intended audience either, and it’s important to remember that this doesn’t cater to the same crowd in the same way as a one-off limited release might. I’m impressed with Brown-Forman for its relative quality to price point, along with approachability and slightly unique flair in an increasingly more crowded space.The sample used for this review was provided at no cost courtesy of Brown-Forman. We thank them for the sample and for allowing us to review it with no strings attached.